A bit of Canadian musical history was made Sunday at the Schulich School of Music – and witnessed around the world. 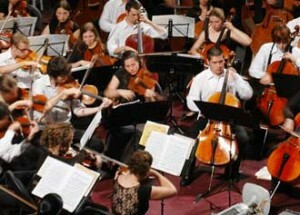 The National Youth Orchestra of Canada performed a full-length concert streamed live over the Internet, marking the first such broadcast by a Canadian youth orchestra. The landmark event underscored the growing role of the Web in diffusing live performances to far-flung audiences. It also highlighted the potential reach of the McGill Multi-Media Room, a cavernous recording facility in the basement of the Schulich School’s New Music Building. And it represented an unusual opportunity for Schulich’s sound-recording experts and NCS Multimedia Services video technicians to team up on a large-scale, top-quality production. The youth orchestra’s 100 musicians – including 14 current or former McGill students — arrived at Schulich last Thursday to begin a weekend of rehearsal and recording sessions under the direction of Alain Trudel, the NYOC’s principal conductor for 2009. By that point, the Multi-Media room already was a beehive of activity as NCS-Multimedia technicians and graduate students from Schulich’s sound-recording program installed mobile cameras, adjusted microphone positions and reviewed scripts for the Webcast and a 32-track, high-definition recording. “This is absolute professional-level” recording, said Schulich professor Martha de Francisco, who supervised the sound-recording team. “This could be a recording for Deutsche Grammophon or for any of the main classical music labels,” said de Francisco, who has recorded renowned classical musicians for major labels. Six cameras recorded the concert in high definition, noted Jean-Guy Tremblay, manager of NCS Multimedia. The objective of the event for McGill was “to build a production process we can replicate afterwards,” said Tremblay, who formerly worked as a producer for the TVA television network. Sunday’s Webcast, streamed at super-high and high speeds, was produced with a high-definition capture system using Silverlight, Microsoft’s latest Web framework for building rich internet applications, said Nicolai Siggel, a McGill graduate whose firm developed the system for NCS Multimedia. According to the video-streaming report of the event, the Webcast was streamed to more than 300 computers. While most were scattered across Canada and the U.S., the concert also drew viewers in Europe, Japan, Australia and Uruguay. For the musicians, the annual youth orchestra represents a great opportunity to network with others from across the country, noted Gordon Foote, Associate Dean (Academic & Student Affairs) at Schulich. Lindsay Roberts, an oboist from Edmonton who just completed her Master’s at Schulich, was one of the musicians chosen this year from auditions across Canada. The NYOC experience is “great preparation for the future,” she said. Trudel, better known around Montreal for his role as music director of l’Orchestre symphonique de Laval, said the NYOC ‘s repertoire is designed to include a broad and demanding range of styles. On the menu Sunday were a rollicking suite from Leonard Bernstein’s West Side Story, Stravinsky’s haunting Sacre du Printemps, and a colourful piece by young Montreal composer Samy Moussa.